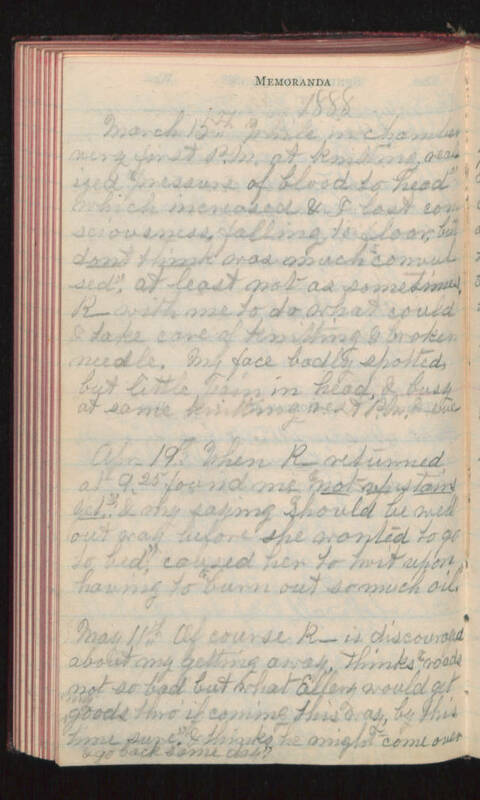 Memoranda 1888 March 15th - While in chamber very first P.M. at knitting, realized "pressure of blood to head" which increased & I lost consciousness, falling to floor, but don't think was much "convulsed", at least not as sometimes. R- with me to do what could & take care of knitting & broken needle. My face badly spotted, but little pain in head, & busy at same knitting rest P.M. & eve. Apr 19th - When R- returned at 9:25 found me "not up stairs yet" & my saying "should be (we'd?) out way before she wanted to go to bed" caused her to (illegible) upon having to "burn out so much oil." May 11th - Of course R- is discouraged about my getting away, thinks "roads not so bad but what Ellery would get my goods thro' if coming this way, by this time sure." & thinks he might come over & go back same day?